Allocating production from the lease level to the well level in the state of Texas can be a challenge. There are a limited number of hard data points and tons of unique cases to be considered. For better or worse, in order to utilize analytics we have to allocate the data to the well level. We provided a quick overview in our Texas Production Allocation Overview. Now we’ll step through an actual lease and watch as the process unfolds. The lease we are looking at is the Hixon-Trout C Unit lease. If you want to pull the data from the RRC, the lease number is 17284 and the district is 01. This lease has a good sampling of several typical scenarios. The wells on this lease continue to produce, but we will be capping the data on this example to 8/2017. This is enough data to get a full picture of the process. Let’s get started. Many leases start with a single well. This is very useful because the lease and well data are the same. In this lease, the 1H well produces for several months before a second well comes online. Here is what that production looks like. At this point in time, we get an influx of new data that we have to handle. The 2H well begins to be reported on the pending lease production export. This export is one of the only places individual well production is reported in the state of Texas. Wells only show on the pending lease production prior to being assigned to a lease. Therefore, the production we have allocated to 2H since it’s completion date must be removed. Then we need to apply the pending lease numbers as they are known values. The change in 2H means that we need to re-allocate the production back to the 1H well. It now gets 100% of the lease production prior to 10/1/14. Well 4H is completed on 10/18/14. This well also shows up on the pending lease production export. Another set of known values. Well 3H is completed on 10/21/14. This well does not show up on the pending lease production export. We will have to combine methods to calculate the production for the 3H. Now we can take the remaining production and allocate it to the other two wells. We do this be continuing the decline on the longest running well (1H) and applying the remainder to the 3H. From here we lose all known values and have to rely exclusively on calculations. We’re in luck though because we have plenty of values to use on our decline curves. We will create decline curves for each well based on the values we have calculated. We will then take those values and assign each well a weight based on the decline value for the period. Finally we take that weight and apply it to the lease production number. This process allows us more accurately account for the movement in lease production and still stay true to the higher producing wells in the lease. Here is what the next nine months look like. So why only the next nine months? Because in February of 2016, we again get some additional data. This time it comes in the form of test data. Test data is the only hard data point we have to work with once pending lease production is gone (if it was ever in the pending lease set). Typically we see new test records once a year at a minimum. Many times we get more than that. Once we have three test records, we can create a decline model of the test data. Each additional test data point beyond three will improve the accuracy of the model, so we’ll incorporate them as they come in for the life of the well. We will utilize a similar method to assign weights to each well based on the decline model we create from the test data. Creating the decline model on test data is not straight-forward, so we’ll detail that in a later post. One other big point about generating the test decline model is that the model will now have reference values all the way back to the very first test. This means we will recalculate the production values based off of this model. This also means that we have to go back to the beginning to illustrate how this all comes together. Here is the final look at the lease. Production curve for each well on the lease. As you can tell from this example, our process is straightforward, logical, and effective. We are very happy with the finished product, but we know there is always room for improvement. If you have any feedback at all, please let us know. Question: how are the Decline % and Test Decline % computed? Are these the same parameters referred to in the decline model used (presumably Arps’)? If so, are these nominal or effective decline values? Appreciate the question. The decline & test % in the allocation process are use nominal decline values. 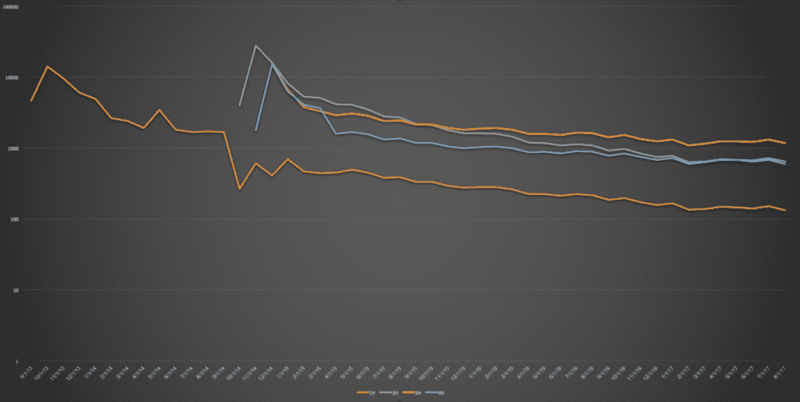 The procedure for generating the declines is the same procedure used in generating our best fit decline which you can read about here – https://welldatabase.com/blog/best-fit-production-decline-and-forecast/. The percentage used in the allocation is not the % that the value declined over the previous period though. The values are declined and then the % is based on the weight of each well’s declined value over the sum of all values for the period. This is an important because it is critical to decline each well in the lease independently (both production and test data) and then apply a weighted percentage to create the allocated value. Hope that answers your question. If not, let me know. Would be happy to go into greater detail.